The Grand Coulee Dam in eastern Washington State is a marvel of engineering and one of the world’s most successful public projects. It is the single largest producer of electricity in the country and one of the largest concrete structures in the world. It was begun in the depths of the Great Depression as a New Deal project and began producing hydroelectric power – and lots of it – just months before Pearl Harbor. Because it produced so much power so cheaply (it cranks out enough today to electrify the Seattle area twice over), many give it some credit for winning World War II since Seattle needed a huge power source during the war years for airplane production. And get this: It was actually designed and built under budget. In 1933, when the project started, the estimated cost of the dam was $168 million. It was completed for $163 million. So, if you are looking for a well-conceived, well-designed, well-managed government project, you need go no further than the Grand Coulee Dam. It’s a little surprising, then, to learn that the idea of the Grand Coulee Dam took shape in . . . 1918. 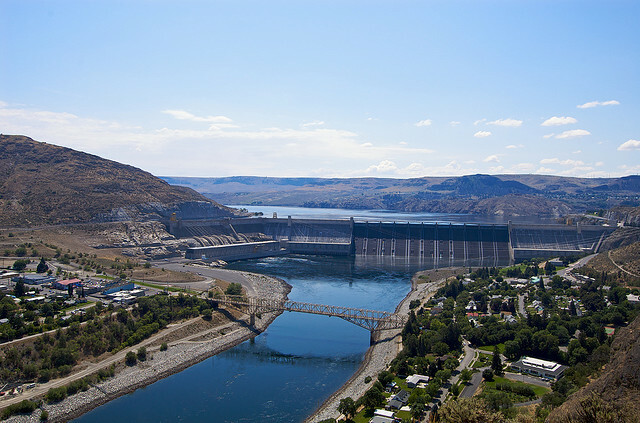 It was then that a group of leaders in eastern Washington found the exact spot for a major hydroelectric dam and conceived its purpose and benefits (cheap power and irrigation for the parched countryside) 15 years before construction started and 22 years before it began producing power. Why? For the reasons any experienced civic leader knows: Great ideas don’t sell themselves; the barriers to change – any change – are high; and sometimes it takes a crisis to motivate decision makers. And, yet, when the right moment comes along, bold ideas seem almost to leap off the shelf. Franklin D. Roosevelt became president in March 1933. Immediately, he and his advisers scoured the country for big public-works projects that could be started in a hurry. One of the first they found – and by far the largest – was the Grand Coulee Dam. There is enormous inertia – a tyranny of the status quo – in private and especially governmental arrangements. Only a crisis – actual or perceived – produces real change. When that crisis occurs, the actions that are taken depend on the ideas that are lying around. That, I believe, is our basic function: to develop alternatives to existing policies, to keep them alive and available until the politically impossible becomes politically inevitable. And it’s not just at the federal level that this lag occurs. Many people know that New York revolutionized police work in the mid-1990s by adopting the “broken windows” theory of social disorder. (Briefly, the theory holds that by strictly enforcing laws against small crimes such as littering, graffiti, turnstile jumping, public urination, and so on, you will head off major crimes. The name comes from the idea that, if a building has one window that’s not repaired, vandals will soon break all the windows.) Here’s the surprise: The theory was published in 1982 and thoroughly discussed at the time. It took 15 years for “broken windows” to get its high-profile test. In Washington, D.C., there’s a mixed-use development going up on the site of the old Washington Convention Center at New York Avenue and 14th Street. It’s a big project: condos, apartments, offices, shops, and restaurants, packed into 10 acres. Sounds great until you learn that the city has been working on getting something at that site for almost two decades. Most of that time, officials knew they wanted a mixed-use facility – they even chose the developer in 2003 – but one delay after another postponed it. Don’t get frustrated. Ideas are often formed in a burst of energy and creativity and then . . . nothing. But simply knowing that the road ahead is likely to be long may help you keep spirits up. If an idea is a great one – if the benefits to the community are obvious – then it will find its moment. Be patient. Keep talking about the idea and refining it. Use this fallow period to prepare your idea and prepare others for your idea by coming up with new ways of illustrating its benefits. If it’s a new museum or a streetcar, how many ways can you help people see the museum and its collection or experience the sensation of moving on rail? Build a committed group of advocates. This is the other thing you can do during the fallow period. The social media allow nearly unlimited ways of keeping the converted in conversation – and converting new people. Use them. Watch for changing circumstances that may allow the “politically impossible” to become the “politically inevitable,” to use Milton Friedman’s words. It could be a crisis, a change of leadership in a key agency or government – or both. And when it happens, bring your new idea and your growing list of supporters to the new leaders’ attention immediately. If FDR had learned about the Grand Coulee Dam idea in 1934 instead of 1933, chances are it would never have been built. The last point bears a little explanation. Sometimes bold new ideas can be presented as, well, not so bold. In fact, even the biggest changes in cities can be offered up as small and safe – if they are presented as experiments. This is how Mayor Michael Bloomberg has remade huge parts of New York, building bike lanes, closing Times Square to traffic, allowing “pop-up” restaurants on city sidewalks, and so on. If he had presented any of these as bold new city policies (which they eventually became), opponents would have killed them. So how did he do it? He offered them as “pilot projects” – experiments in a small area for the purpose of observation. In part he did this because it allowed the city to do things without going through the cumbersome and delay-prone public review process. But Bloomberg is also an astute observer of human (and political) nature. Had he proposed narrowing hundreds of New York streets for bike lanes, the howls of protest would have drowned out the idea, all of them predicting economic and physical gridlock. But by doing just a few blocks at first, then a few more, then a few more, then a lot more, the mayor and his staff proved that even the busiest New York streets could accommodate cyclists, motorists, and truck drivers – and be more humane for it. You may be able to offer your change as bite-size pieces, or maybe not. It’s hard, for instance, to build just part of the Grand Coulee Dam and use it as a demonstration project. But whether you offer your great idea as a series of small steps or one long stride, the same advice applies: Be patient. Photo by Jeff Hanway licensed under Creative Commons.